And how are related Pythagoras with Mars-day? ... Well ... Pythagoras still rotate in Time in Crotone Italy or Egypt or Mount Carmel ... but he die over 2000 years ago ... and return and return until he was Koot Hoomi and like Master KH (Koot Hoomi) he rules the Mars-day ... and the Pink ray of Love ... the Love of God. Therefore we prefer to honor him ... talk on Mars-day ... Tuesday ... about Numbers. And there are another Master Serapis Bey ... which name is close to Seraphim angels ... a type of Angels very beauty ... very Smart that began to arrive to Earthly plane from the beginning which are related to Serapis. Serapis Bey was in Egypt the Pharaoh Amenhotep III, c. 1417-1379 B.C., Egyptian pharaoh, called "the Magnificent." and also Leonidas, King of Sparta ... as well Phidias ... the Greek Architect ... that origin the name "Phi". The Base of the Spine Chakra is a "Zone of White and Pure Vibrational Energy" ...that create a "Strong" connection with Mother Earth and Earth Core. ... Without to Open that Chakra ... and you can take years ... is a non sense ... Can the Planet let you remember ... you are one his/her dwellers and "She" (Mother Earth) ... remember you? ... Well, if you feel that ... and live that ... in your White Chakra ... that Chakra has been opened. This happens generally alone after many months of prayer. Seraphim of Justinius, come forth in the name Serapis Bey! Be seated in your own Cosmic Threefold Flame. Unprecedented is the gift of God through Cosmos, <2> and you may never know until you are ascended just what impetus toward bodhisattvahood you have received. By this action, then, I, Serapis, may take my place and stand upon your six o’clock line, if you will allow it. [“Yes.”] And I shall stand with my sword, beloved, for this sword has many names and vibrations as held by our bands. Thus, see it as Excalibur, fleur-de-lis, the hallmark of Ascension’s victory. Now then, what have you received? Impetus to master the six o’clock line of God Harmony, of the Ascension Flame, of the sacred fire, of the purity of the Divine Mother in the base-of-the-spine chakra and hence in all chakras above. I may come, then, as the representative of Cosmos and of God Harmony to give you initiations both within my retreat and wherever you are for the mastery of God Harmony, nevermore to dally in self-sympathy, pools of pity, words of babbling brooks of self-justification. Death itself is the misuse of [and the consequence of the misuse of] this chakra. Thus, beloved, it is a fount of eternal Life unto those who celebrate Life, but it is also a fountain of Death to those who celebrate the rituals of Death. When the chamber is strengthened by those who understand wholeness (by those who should have heeded the Messenger’s reminder as the decade began that the decade of the eighties is the decade for the mastery of the Eightfold Path and [of the] completion [of cycles]), and when, therefore, that [eight-petaled] chakra is [also] strengthened, the heart can expand, the threefold flame of the heart can expand. Think you, then, that the threefold flame when raised to your own height shall not also cause that chamber to become a Cosmic Egg? Aye, it is so! Think you that eight Buddhas shall not come and manifest in those petals [when you shall have sufficiently balanced and expanded that threefold flame]? Aye, it is so. Thus, without mastery of the Flame of Mother [on the six o’clock line], without true desiring to dissolve all differences [inharmony] between thyself and all mothers and the Divine Mother, there can be no entering in [to the secret chamber of the heart]. One’s perfections or imperfections are not the determining factor in the merit of one’s love. One loves the principle of Mother [of Cosmic Motherhood: of God as Mother], the mantle, the office and the soul [of Mother]–day by day embodying more of that Flame. Thus, beloved, this is the key to the six o’clock line of Sanat Kumara, <5> who bears the Flame of Guru, and the Flame of Mother in the process. Know, then, that the Divine Mother is the key to the heart of God in the center of being and that Buddha is Father and [that] Father must be approached through Mother. In the [process of the] transmutation and dissolution of worlds of karma with various mother figures, I do exhort you to select one Ascended Lady Master such as Mother Mary, Kuan Yin, the Goddess of Liberty and to give such intense devotion to that image and that flame that through that heart you might dissolve all separation from the Mother of Cosmos. In your desiring to accomplish this, beloved, as long as the fervor be intense you may elect to give this devotion to more than one. What is required, however, is that an intensity of devotion be given to one; and then if you can increase and multiply it by also embodying the flame of another, you should surely do so. Thus Kuan Yin and Mother Mary and the Goddess of Liberty present to you their hearts for this purpose, as do the members of the Karmic Board: Portia, Mother of Aquarius; Pallas Athena, wielding the sword of Truth; Nada, [being of Love and Love’s alchemy of healing]. In the understanding of the seven rays, then, embrace thy Mother and be free. Be free to go to the center [of the Cosmic Clock, the center of the Cosmic Christ consciousness,] to make your rounds and thus to be allowed to move on, step-by-step through the initiations of the five secret rays. These will not come simultaneously. 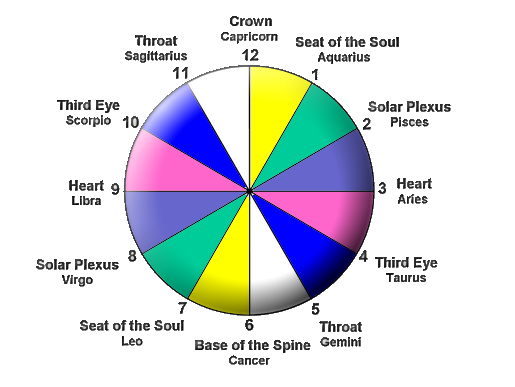 But if you examine your chart, you will note that when you emerge from the center of your Clock, you arrive at the gate of the seven o’clock line, the gate of the Goddess of Liberty and Lords of Karma, who approve your petitions to enter now the five secret-ray initiations of the Holy Spirit. I will tell you, then, that a sufficiency of light and balance of the threefold flame must be present with[in] the seat-of-the-soul chakra on that seven o’clock line and in the soul in order for you to proceed with the First Secret Ray initiation. Pursuing this with all diligence, you shall catch up to the fourteen-month cycles <6> and therefore be in sync with the world action of initiation, [with] holders of the flame with Serapis and [with] all members of Hierarchy of this stepping-up of the earth. For the record I say it again, the decade of the 1990s will find you being challenged to prove your mastery by the Power of the Three-Times-Three–balanced threefold flame of I AM Presence, [of] Holy Christ Self and [of] your own heart flame. Let the heart meditations of Saint Germain be followed to that purpose. <7> As you desire and bring forth devotion to the threefold flame of Liberty in each line of the Clock, you are building momentum for the quadrants, for the mastery of the four elements, and for this purpose of having the equilibrium to enter the five bands of the secret rays. I, Serapis, predict that when you raise up this God-determined Light of the Mother and see the course that is set before you as paramount, They shall not pass. They shall not prevail. They shall not undo or overtake. O soul most beloved, gaze into the cosmic mirror and know thyself as thou truly art. So truly knowing thy True Self, thou art victor in the threefold flame. I bless thee, one and all. 1. The Ascension Temple, etheric retreat of Serapis Bey, Chohan of the Fourth Ray, is located at Luxor, Egypt. For information on the retreat, past lives, and teachings of Serapis Bey, see Mark L. Prophet and Elizabeth Clare Prophet, Lords of the Seven Rays: Mirror of Consciousness, Books One and Two; Serapis Bey, Dossier on the Ascension; glossary in Saint Germain On Alchemy, pp. 378, 447, 449-50. 2. Mighty Cosmos, 1988 Pearls of Wisdom, vol. 31 no. 63, pp. 489-92. 3. The Ascended Master Djwal Kul teaches in Intermediate Studies of the Human Aura that the secret chamber of the heart “is the place where the chela contacts the Guru. It is the place where the laws of cosmos are written in the inward parts of man. For the law is inscribed as the Eightfold Path of the Buddha upon the inner walls of the chamber....The eight petals of the secondary heart chamber symbolize the mastery of the seven rays through the flame of the Christ (called the threefold flame) and the integration of that mastery in the Eighth Ray” (pp. 38, 41; The Human Aura, pp. 108, 111-12). In Gautama Buddha’s first sermon following his enlightenment, he taught the Four Noble Truths and the Eightfold Path. The Four Noble Truths state that (1) life is dukkha (out-of-alignment; variously translated as suffering, pain, sorrow, discontent, imperfection, sin, evil), (2) the cause of dukkha is inordinate desire, (3) freedom from dukkha is in the attainment of Nirvana, (4) the way to this liberation is through the Eightfold Path, which the Ascended Masters teach corresponds to the eight rays: Right Understanding, First Ray; Right Thought, Second Ray; Right Speech, Third Ray; Right Action, Fourth Ray; Right Livelihood, Fifth Ray; Right Effort, Sixth Ray; Right Mindfulness, Seventh Ray; Right Concentration, or Right Absorption, Eighth Ray (see 1983 Pearls of Wisdom, vol. 26 no. 21, pp. 166-67). 4. John 20:29; I John 4:20, 21. 5. In Sanat Kumara’s Pearls of Wisdom series “The Opening of the Seventh Seal” he explains that he occupies the office of the Divine Mother, or the Woman, on the 6 o’clock line of the Cosmic Clock. 1979 Pearls of Wisdom, vol. 22 no. 21, pp. 122, 127; no. 23, p. 142 diagram; no. 30, p. 186 diagram; no. 33, p. 202; no. 34, p. 212; no. 38, p. 240; no. 41, p. 275 diagram. 7. Saint Germain’s Heart Meditation I and II. 1988 Pearls of Wisdom, vol. 31 no. 42, pp. 339 n. 6; no. 61, p. 479 n. 3. 8. The thesis that the AIDS virus was created in the laboratory by genetic manipulation of deadly animal viruses, enabling them to cross the species barrier and attack the human immune system, is examined by Elizabeth Clare Prophet and her guests on the Summit University Forum “The AIDS Conspiracy: Establishment Cover-up, Pharmaceutical Scam or Biological Warfare?” on 3 videocassettes, 4-1/2 hr., GP88078; 4 audiocassettes, 4-3/4 hr. 9. Four Principles of the Godhead: God as Father (Impersonal Impersonality), Mother (Personal Personality), Son (Impersonal Personality), and Holy Spirit (Personal Impersonality). Djwal Kul, Intermediate Studies of the Human Aura, pp. 48-51, 69, or The Human Aura, pp. 119-22, 141; Elizabeth Clare Prophet, The Great White Brotherhood in the Culture, History and Religion of America, fig. 9, following p. 176; pp. 179-80.